The AX-P3 Recyclable sandblaster is a device for polishing the surface of small objects, it has an delicate design, simple structure, and strong compatibility. It achieves automatic sand circulation according to the principle of pneumatic negative pressure siphon. The machine's advantages are: good airtightness, no overflow of sand, safe operations, artistic design and cheap price. 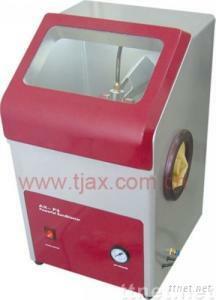 This machine is upgraded from the AX-P2 Recyclable sandblaster, it has all the advantages of the last model. Besides, it has a built-in oil and water filtering device. The newly-designed lid enables dustless operations.